The restored site Cölbe in the river Lahn is located in the Federal State of Hesse. The river section belongs to the ‘Auenverbund Lahn – Ohm’ set up for the protection and natural development of the floodplains and tributaries of the rivers Lahn and Ohm. It serves as an important area forcharacteristic species, flood prevention, local recreation and the local climate.Restoration measures were implemented in 2000 on a river length of 200m. The main aim was a morphological improvement as the river course was straightened and natural instream habitats were largely missing. 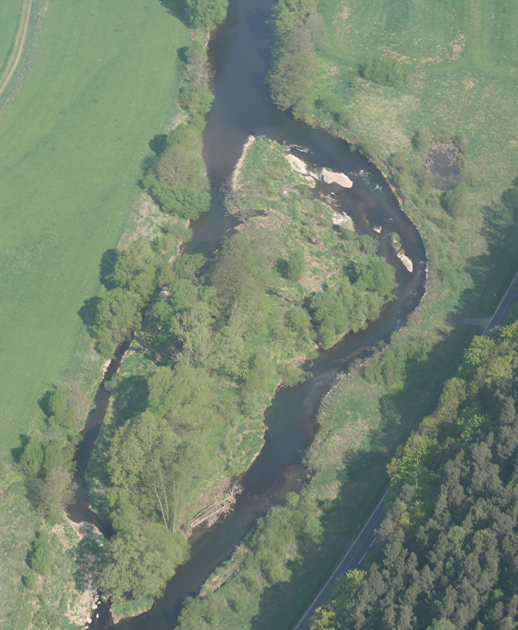 Therefore, bank fixations were removed to initiate bankside erosion and the river bed and banks were restructured to enhance habitat and biotic diversity.